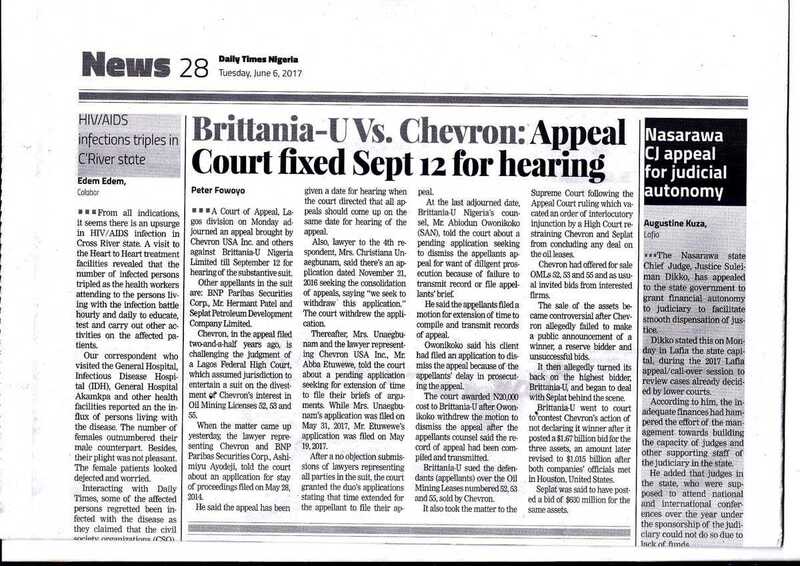 The hearing of the appeal brought by Chevron USA Inc. and others against Brittania-U Nigeria Limited has been moved to September 12, 2017 on Monday, June 19, 2017. 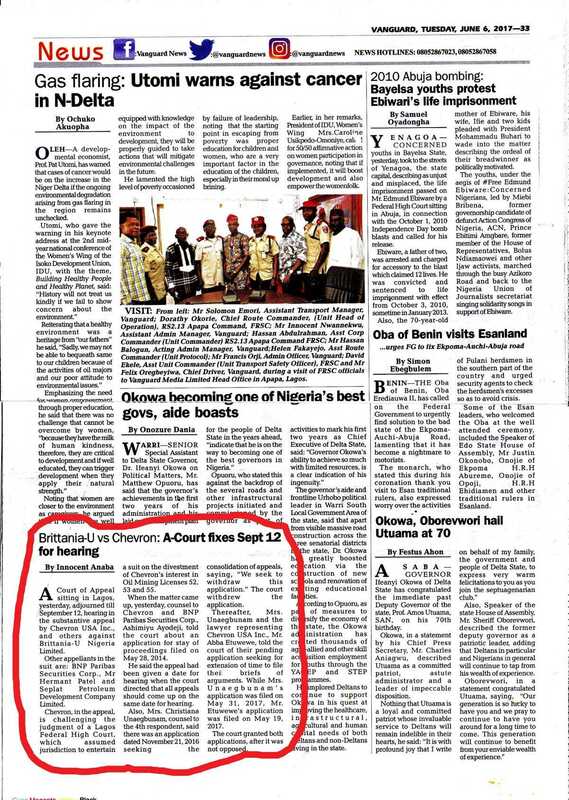 The appeal, along with two other appeals filed by Seplat Limited on one hand and Chevron USA & Anor on the other hand, challenges the ruling of the Federal High Court delivered on May 13th, 2014. By that ruling, the Court held that the Federal High Court had jurisdiction to adjudicate on the action. 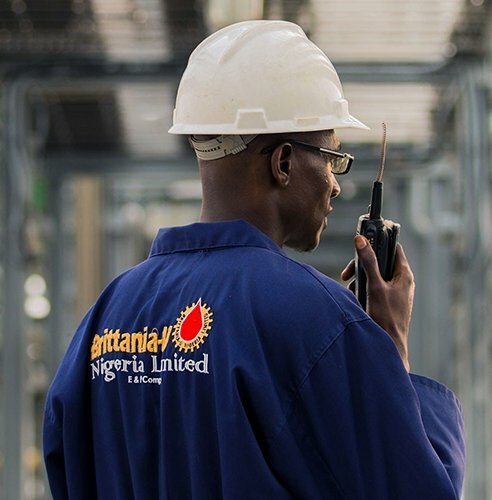 The action, which was instituted by Brittania-U Nigeria Ltd seeks, amongst others, an order of specific performance against the Defendants (now Appellants) to effect the transfer of Chevron’s 40% interest in OMLs 52, 53, and 55 to Brittania-U Nig. Ltd.
Other appellants in the suit are: BNP Paribas Securities Corp., Mr Hermant Patel and Seplat Petroleum Development Company Limited. 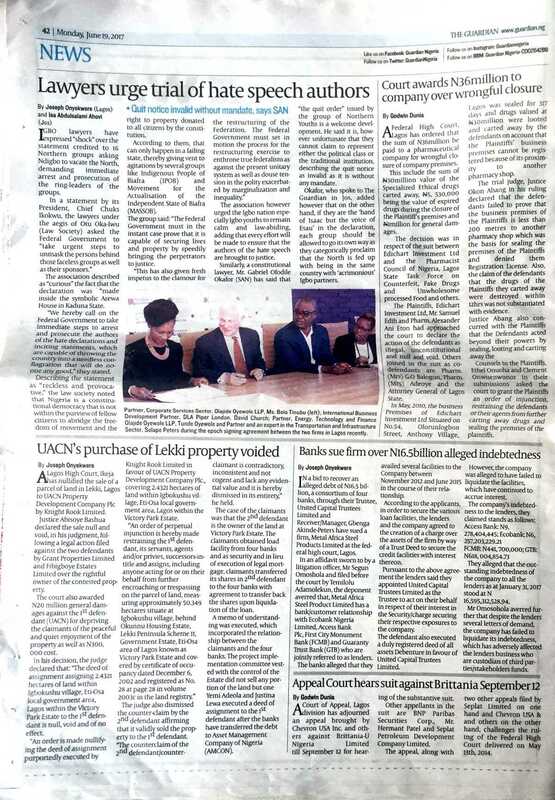 A Court of Appeal sitting in Lagos, yesterday, adjourned till September 12, hearing in the substantive appeal by Chevron USA Inc., and others against Brittania-U Nigeria Limited. Chevron, in the appeal, is challenging the judgment of a Lagos Federal High Court, which assumed jurisdiction to entertain a suit on the divestment of Chevron’s interest in Oil Mining Licenses 52, 53 and 55. When the matter came up, yesterday, counsel to Chevron and BNP Paribas Securities Corp., Ashimiyu Ayodeji, told the court about an application for stay of proceedings filed on May 28, 2014. He said the appeal had been given a date for hearing when the court directed that all appeals should come up on the same date for hearing. Also, Mrs. Christiana Unaegbunam, counsel to the 4th respondent, said there was an application dated November 21, 2016 seeking the consolidation of appeals, saying, “We seek to withdraw this application.” The court withdrew the application. Thereafter, Mrs. Unaegbunam and the lawyer representing Chevron USA Inc., Mr. Abba Etuwewe, told the court of their pending application seeking for extension of time to file their briefs of arguments. While Mrs. Unaegbunam’s application was filed on May 31, 2017, Mr. Etuwewe’s application was filed on May 19, 2017. The court granted both applications, after it was not opposed. At the last adjourned date, Brittania-U Nigeria’s counsel, Mr. Abiodun Owonikoko, SAN, told the court about a pending application seeking to dismiss the appellants’ appeal for want of diligent prosecution because of failure to transmit record or file appellants’ brief. Owonikoko said his client had filed an application to dismiss the appeal because of the appellants’ delay in prosecuting the appeal. Chevron had offered for sale OMLs 52, 53 and 55 and as usual invited bids from interested firms. 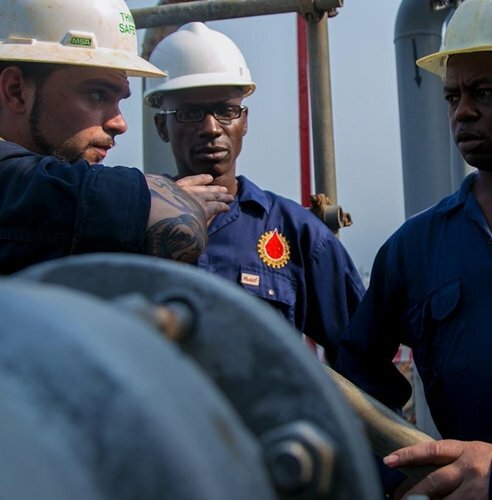 The sale of the assets became controversial after Chevron allegedly failed to make a public announcement of a winner, a reserve bidder and unsuccessful bids. Brittania-U went to court to contest Chevron’s action of not declaring it winner after it posted a $1.67 billion bid for the three assets, an amount later revised to $1.015 billion after both companies’ officials met in Houston, United States. The other appellants in the suit are: BNP Paribas Securities Corp., Mr Hermant Patel and Seplat Petroleum Development Company Limited. Brittania-U sort an order of specific performance against the defendants (appellants) to effect the transfer of Chevron’s 40% interest in the OMLs to the plaintiff. The plaintiff said despite the pendency of the action, Chevron allegedly divested some of the interests to Seplat. The Appellate court granted Seplat and Chevron USA’s motion for extension of time to file their separate briefs of argument in their appeals, which will also be heard September 12. 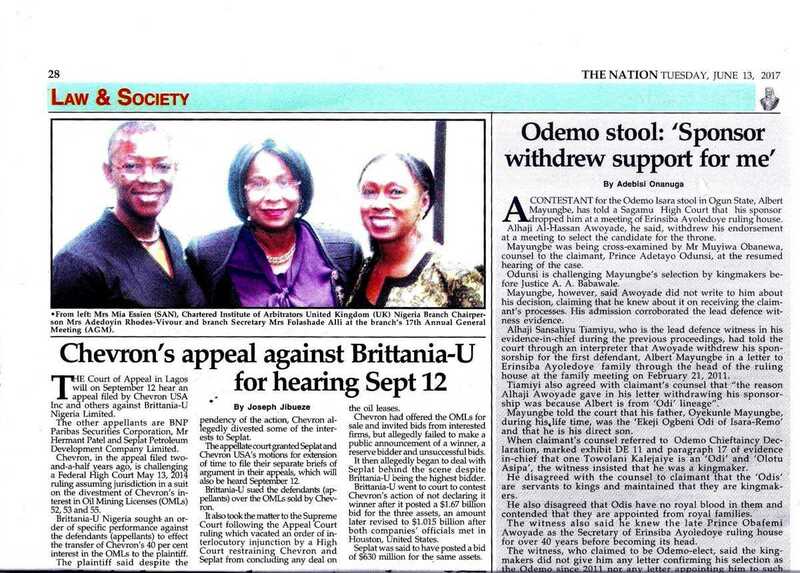 Brittania-U sued the defendants (appellant) over the OMLs sold by Chevron. 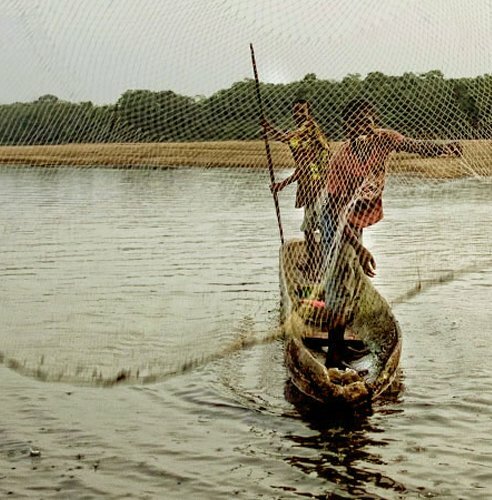 Chevron had offered for sale OMLs 52, 53 and 55 and as usual invited bids from interested firms but allegedly failed to make a public announcement of a winner, a reserve bidder and unsuccessful bids. It then allegedly began to deal with Seplat behind the scene despite Brittania-U being the highest bidder. 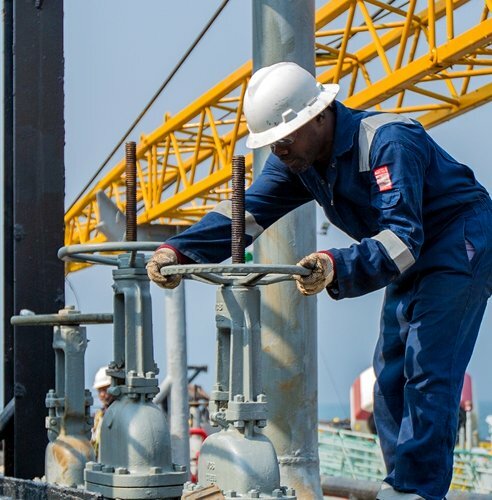 A Court of Appeal, Lagos division has adjourned an appeal by Chevron USA Inc., and others against Brittania-U Nigeria Limited till September 12 for hearing of the substantive suit.